To further improve cosmesis and perhaps reduce the disability associated with current laparoscopic operations single incision laparoscopic surgery has been advocated. Single incision laparoscopic surgery has been applied to cholecystectomy and appendectomy. We report on the application of this technique to adjustable gastric banding. Methods: Six patients with BMI of 41-44 underwent single incision laparoscopic band placement, one with associated hiatal hernia repair. The average size of the incision was 4 cm, placed in the umbilicus for 2 patients and in the right upper quadrant for the remainder. Within this incision, 4 ports were placed for camera, liver retractor and two working ports. Results: All 6 patients underwent uneventful single incision laparoscopic gastric banding, with 1 patient also having hiatal hernia repair. The average operative time was 94 minutes (range: 76 min to 129 min) similar to standard laparoscopic band placement with 5 ports. When hiatal hernia was repaired in addition to band placement, the operative time was 199 minutes. There were no intraoperative complications and all the patients were discharged on the same day of the surgery. When subjectively evaluated at 2-week follow up, most patients required minimal pain medications and were able to return to ADLs in the range of 4-7 days. All the patients were very satisfied with the cosmetic results of the single incision surgery. 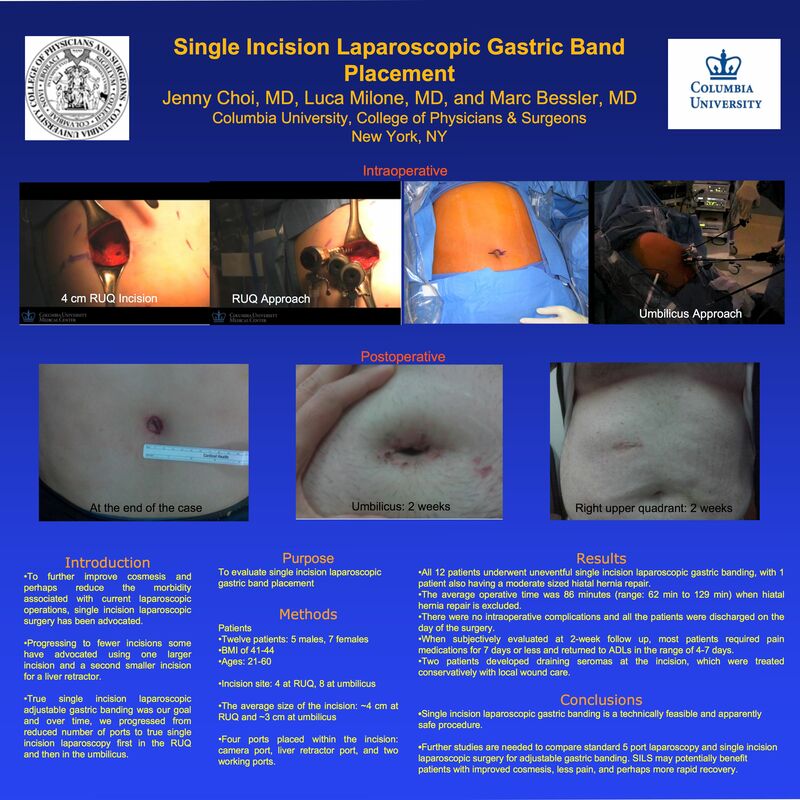 Conclusion: Single incision surgery laparoscopic gastric banding placement is a safe, feasible procedure that may potentially benefit patients with better cosmesis and perhaps less pain, and more rapid recovery.